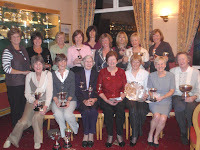 The Lady golfers of Ponteland Golf Club held their AGM recently when the retiring Captain, Ethel Arthur, presented the trophies and medals to the 2009 winners. Three of the Ponteland ladies take up County positions next year when Linda Hoyle becomes County Captain, Hazel Furniss takes over as the Vets Captain and Rachel Bruce is the Junior Captain. We wish them all well and success for their teams. Margaret Bates, formerly Margaret Cobb is the newly elected Captain of Ponteland Ladies’ Section.